Anti-Semitism on college campuses is growing, with more than half of Jewish students claiming they have witnessed or been subjected to some form of anti-Jewish harassment, according to a new report by a leading human rights organization. With college campuses across the country acting as a hotbed for anti-Israel activism, Jewish students say they are beginning to be targeted on the basis of their religion, according to a nationwide survey conducted by Trinity College and the Louis D. Brandeis Center for Human Rights Under Law. Perhaps most surprising, the report found evidence of anti-Semitism across the country, a finding "strongly suggesting anti-Semitism on campus is a nationwide problem," according to the report. The findings come as anti-Semitic incidents rise across the globe, with Jewish citizens being targeted for attack by Islamic extremists and far-right neo-Nazis. This has been accompanied by several high-profile episodes on college campuses in which Jewish students have been subjected to harassment and, in some cases, violence. The Trinity College researchers who performed the study said they were surprised by the findings. "The patterns and high rates of anti-Semitism that were reported were surprising," said Ariela Keysar, an associate research professor at Trinity who co-wrote the report with her colleague Barry Kosmin. "Rather than being localized to a few campuses or restricted to politically active or religious students, this problem is widespread. Jewish students are subjected to both traditional prejudice and the new political anti-Semitism." The survey was conducted prior to last year’s conflict in the Gaza Strip, when incidents of anti-Semitism spiked globally. "That a majority of Jewish students felt that they had suffered or witnessed incidents of anti-Semitism on the college campus in only one academic year was an unexpected finding which requires very serious investigation," the report states. Anti-Semitic incidents were found to be underreported, meaning that the number of episodes occurring on campus could be higher than found in the survey. Of those who reported having "witnessed or personally been subjected to anti-Semitism," 29 percent said it had occurred at the hands of another student. Ten percent said it occurred in a club or society on campus, while 3 percent said the anti-Semitism was a product of the "university administrative system," according to the report. "The data shows that few types of Jewish students are immune from or can avoid this problem on today’s campuses," according to the report. The report further found that students identifying as liberal and as conservative both experienced anti-Semitism. It also found the such treatment was experienced by students who do not overtly identify as Jewish by wearing a yarmulke or other traditional forms of observance. "Membership in a Jewish campus organization such as Hillel, Chabad, or a Jewish fraternity/sorority raises the likelihood of reporting anti-Semitism," the report states. "The fact that members of [the American Israel Public Affairs Committee], a vocal pro-Israel organization, report the highest rate of anti-Semitism could be interpreted to support the notion that campus anti-Semitism has a political element," it states. "Nevertheless, half of the more liberal-oriented ‘peacenik’ J Street members report anti-Semitism." This finding "belies the canard that campus anti-Semitism is perceived primarily by conservative or right-wing students," the researchers concluded. The report additionally found that anti-Semitism was reported at a higher rate among students at colleges in the traditionally liberal areas of the Northeast United States. One student who anonymously responded to the survey said that anti-Semitism is often associated with liberal political groups advocating boycotts of the Jewish state. 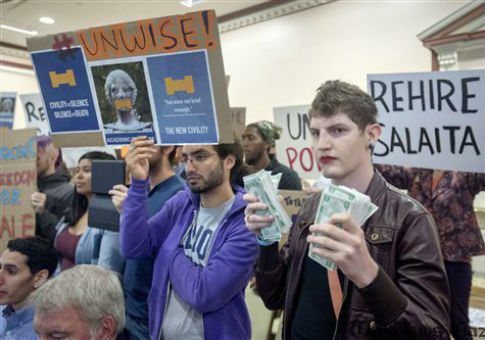 "The divestment campaign and other anti-Israel campaigns on this campus are intertwined with rampant anti-Semitism," the student was quoted as saying in the report. "After a widespread anti-Israel/anti-Semitic attack earlier this year the University issued a weak response. Jewish students … want to know that our University stands by us." The results in the United States are slightly higher than those found in a similar 2011 study conducted in the United Kingdom, where Jewish citizens often find themselves under attack from far-left groups. Ken Marcus, president and general counsel for the Brandeis Center, said his organization often hears from students who "find that their experiences of anti-Semitism are not taken seriously." "This report gives substance and data to their experiences," Marcus said in a written forward to the report. "The scope of this problem is greater than most observers had realized." "Kosmin and Keysar’s eye-opening findings should awaken authorities to the need to address campus anti-Semitism much more aggressively, comprehensively, and effectively than they are now doing," he said. This entry was posted in Politics and tagged Anti-Semitism, Israel, University. Bookmark the permalink.